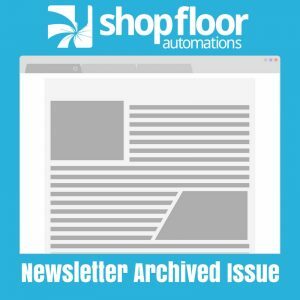 The following is an archived copy of the Shop Floor Automations Newsletter – September/October 2014 issue. Predator Software has released a new version of the Predator CNC Editor. The new features include support for Windows 8, a new backplot engine, support for sub programs and subroutines, a new check code and several new improvements. Customers on maintenance can download v10 from our website at anytime. Customers running v9 or older should contact us for upgrade details and pricing. Are you moving or adding new machines in the next 12 months? We have found that we can be of great assistance if we are brought into the planning stages early. We have 16 years of experience in setting up new systems and migrating plants to new locations. If you are using RS232 cabling, consider upgrading to a wireless solution. We also offer consulting on computer requirements, infrastructure, and the next step toward document control, paperless manufacturing, and machine monitoring. Reach out to us to migrate your DNC system to Windows 7 or 8 with the ability to control and manage your network based CNCs. Our Account Executives are here to support you with a click away. In a recent case study done by Modern Machine Shop in October 2014 issue, Scytec Data Xchange maximizes efficiency on the shop floor. “Productivity monitoring can be a vague concept to wrap your head around, but once you see it for yourself with our own machines and with live data, you wonder immediately how you ever operated without that knowledge and awareness.” said Jerry Halley. The cloud-based machine monitoring from Shop Floor Automations enabled aerospace parts manufacturer, Tech Manufacturing, to reduce lead times and improve productivity. The process started with a few machines at a low cost, of $45 per machine, per month and the ROI was seen within a few weeks. Low cost upfront, no long term contracts and easy to get started with any type of CNC controller.